With an average height of 45 inches, emperor penguins are the largest of the world's 17 penguin species. A number of adaptations allow emperor penguins to thrive in the harsh conditions of mainland Antarctica, where winter temperatures drop as low as 76 degrees below zero Fahrenheit. Like all penguins, emperor penguins compensate for their inability to fly with exceptional swimming and diving capabilities. All penguins, the emperor included, have dark backs and light-colored bellies. When using their flippers to propel themselves through the sea, this coloration, called countershading, camouflages penguins in the eyes of both predators above and prey below. Emperor penguins have sharp, slim beaks. The feathers on their heads are black, save for lighter patches that surround their concealed ear canals. Penguins have no external ear organs. Portions of those patches, as well as an area just below the neck, are dark yellow. The emperor penguin's diet is made up of fish, squid and krill, which are tiny crustaceans approximately 2 inches long. Often hunting in groups, emperor penguins may dive as deep as 1,850 feet in search of a meal. They can remain submerged for as long as 20 minutes. Penguins have not teeth but backward-pointing barbs inside their throats enable them to swallow their prey. Emperor penguins breed from June to August, which represents the Antarctic winter. Mating pairs, which are monogamous for the duration of the breeding season, yield one egg at a time. In lieu of nests, both parents take turns balancing their egg on the tops of their feet. Both males and females have a brood pouch -- loose folds of excess skin -- that they drape over their egg to keep it warm. Upon laying her egg, the female departs for about two months while she hunts for food, leaving the unborn chick in the care of the male, who fasts while he incubates and may lose up to 45 percent of his body weight as a result. The female returns two months later and takes over care of the offspring so the male can his turn at foraging. 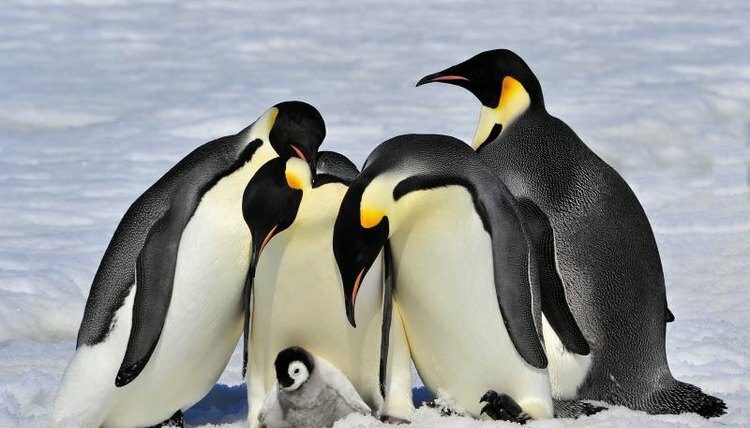 Highly social birds, emperor penguins form large colonies during the breeding season. To cope with frigid Antarctic temperatures, groups of emperor penguins will often huddle, with each individual taking a turn standing in the center of the group, where it is warmest. Emperor penguins are slow walkers -- they generally do not exceed 1.7 miles per hour -- and therefore sometimes resort to sliding on their bellies across the Antarctic ice. This method of locomotion is known as tobogganing.